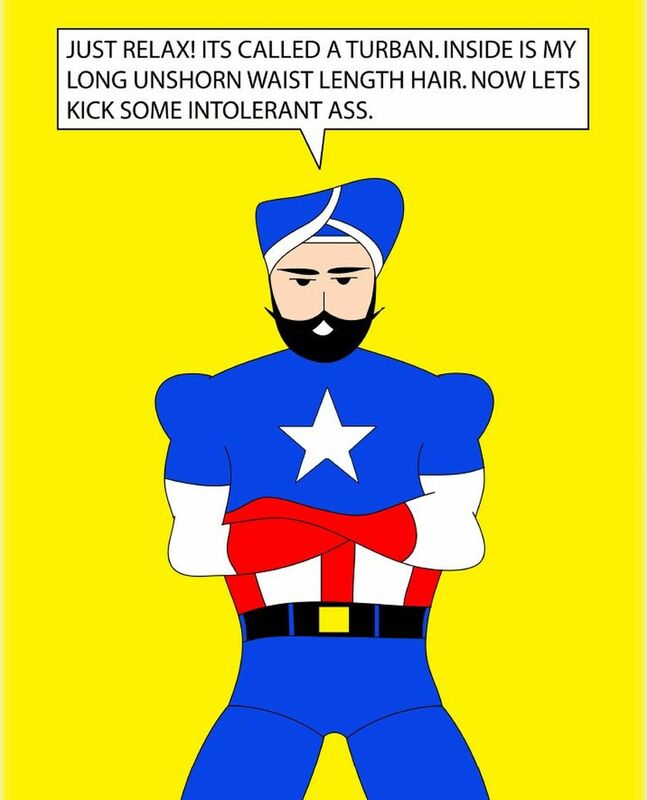 Vishavjit Singh draws cartoons and dons a Captain America costume to help fight intolerance and bigotry. He visited Seattle earlier this month to launch an exhibition of his illustrations, on display through February 2019, at the Wing Luke Museum. 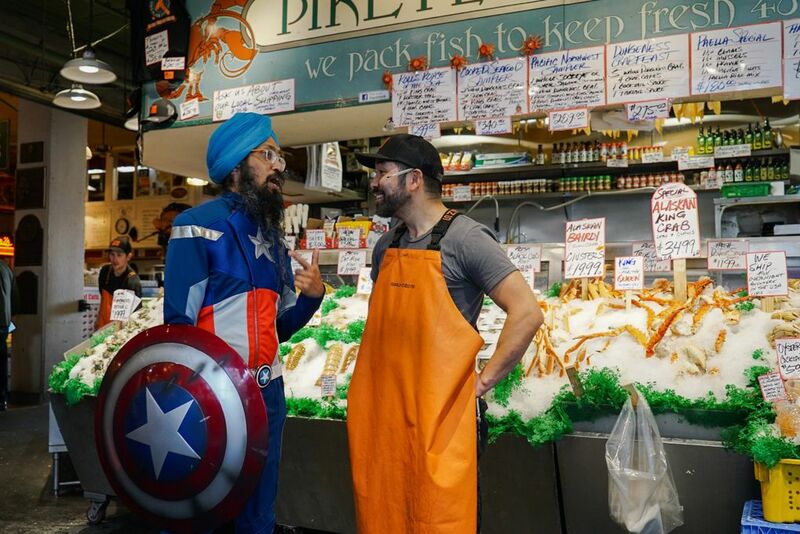 On a sunny Tuesday afternoon in Seattle’s Pike Place Market, Sikh Captain America is decked out in a red, blue and silver superhero outfit, complete with a blue turban, shield and long beard. To exclamations of “Yes! 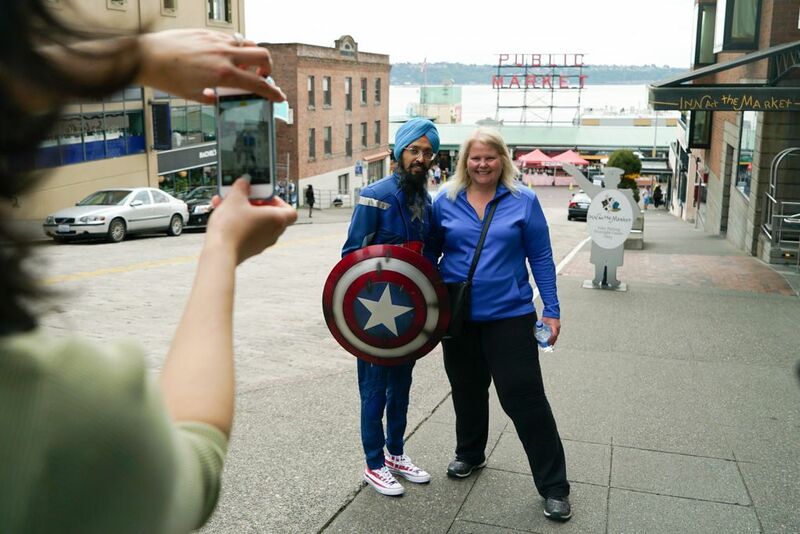 Captain America!” from passersby, the smiles of excited children and requests for photographs, Sikh Captain America turns heads and makes people stop and think. 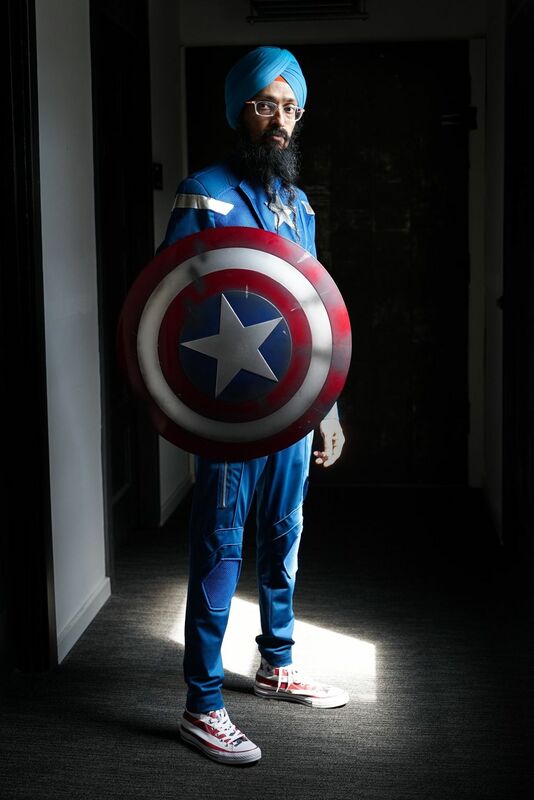 This is exactly what “accidental cartoonist,” performance artist and activist Vishavjit Singh was hoping to do when he created his Sikh Captain America alter ego. Coming from what he calls a typical South Asian family, Singh says he was expected to be a doctor or engineer. But after 9/11, his path dramatically changed. Months went by and Singh realized that if more stories of Sikh Americans were going to be told, someone from the Sikh community would have to step up and tell them. 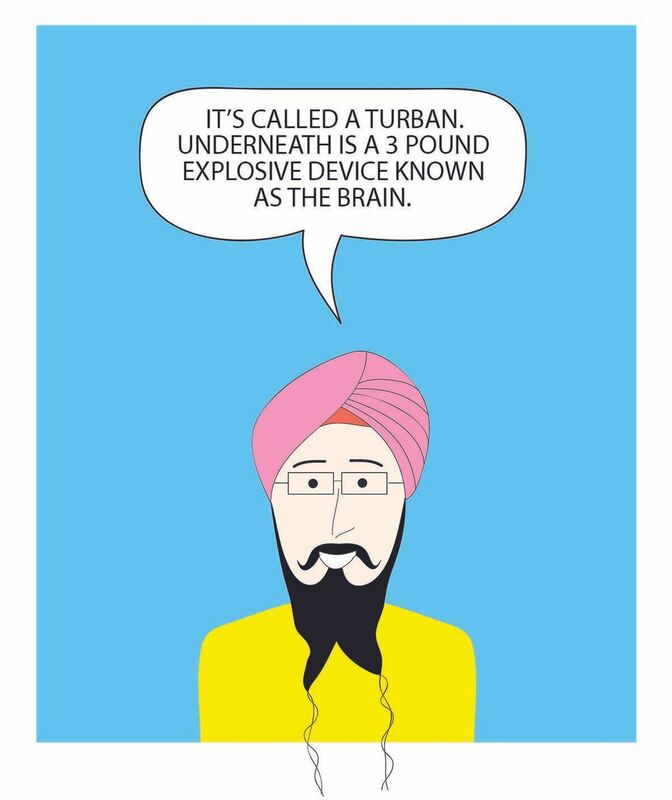 Singh taught himself to draw, and in 2002, his website Sikhtoons.com, which features his cartoons targeting intolerance and bigotry, was born. Singh, who lives in New York City, visited Seattle earlier this month to launch an exhibition of his illustrations, on display through February 2019, at the Wing Luke Museum. Sikhs (pronounced “six”) are the fifth-largest religious group in the world. The majority of Sikhs live in the Punjab region of India, while an estimated 500,000 live in the United States. The ideas of “oneness” — that there is one divine creator that all faiths worship and that can be found within each person, and of equality of all people, are central to Sikh beliefs. To this end, many Sikhs adopt the names “Singh” for men and “Kaur” for women to remove the caste or class attachments of family surnames. 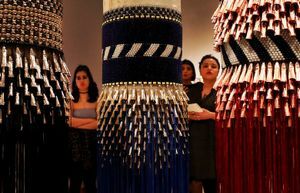 As one of the Sikh articles of faith, women and men are expected to have unshorn hair. Many Sikh men (and some women) choose to wear a turban as a demonstration of their faith. It is this visible aspect of Sikh identity that has made their community the target of much of the ignorance, hate and violence post-9/11. In a chilling example of the continued threats to the Sikh community, a Sikh man in Kent was shot and wounded in his driveway last year by an assailant who reportedly yelled, “go back to your own country.” Hate crimes against Sikh-Americans in the U.S. increased 17 percent between 2015 and 2016, according to the nonprofit organization South Asian Americans Leading Together, citing FBI data. Jasmit Singh, one of the co-founders of the Sikh Coalition and a longtime activist for immigrant rights, says the Sikh community was shaken by the attack in Kent. “The community, and especially the elderly, felt very unsafe about being outside,” he said. This story has been updated to clarify where Vishavjit Singh made his first appearance as Sikh Captain America.